No, they aren’t sending staff to charm school… we’re talking Social Media in this case. If you peruse the various BOTW products you’ll start seeing more social media integrated into the listings and pages. For example, on BOTW Local even the FREE “Jump Start” listings have newly added fields for Twitter, Facebook, and Linked in. Not bad for a freebie. Incidentally, while most directories SAY they offer a free option but pretty much just ignore their free queue… I can assure you the Jump Start queue in BOTW Local is very actively worked. In order to not accidentally over-promise, our documentation says we’ll make an up or down call inside 6 months… BUT… the Local Team had actual times down to a month a while back. Oddly, even though that’s a fraction of what’s needed to meet our promise, even *that* wasn’t good enough. Staff asked us to add people to that team so we could get it down even lower. Last I checked it was hovering around 2 weeks out. If we add anybody else in there we’ll be approving them before you send ‘em. Anyway, just thought I’d mention that if the marketing budget’s too tight to go for an upgraded route at present, do NOT just walk away empty handed. The BOTW Local Jump Start listing is IMO one of the best bargains you’ll ever find on the web. “Free” is a tough price to beat… and if the business qualifies for a listing it WILL get listed in a timely manner. Last call eh? Now you know where I spent all my time in college. 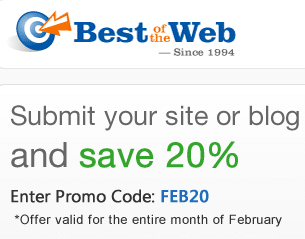 Just a note to remind you you have until midnite to use the BOTW February 2011 promo code. Don’t miss out on this chance to save 20% on one or a combination of the following directory products… BOTW Directory, the BOTW UK & Ireland Directory, and the BOTW Blog Directory. For details, see 20% Off BOTW Submissions. Having spent the better part of a decade working at what some of us exes refer to as “TOD” (The Other Directory)… I still have fond memories of the time there. Entered as a rookie webmaster that ran across it back in its early days (1999), and over the years there learned a ton about the internet, SEO, and of course the nature of volunteer work. As the directory there grew it managed to become a target of a lot of folks. Some of the criticism was valid, some not, but inside it was common practice of some of us to sorta make fun of ourselves based on the stereotypes. Sure, some of the stereotypes were spot on… but as is the case in many instances, a lot were just imagined. Either way, you can argue or you can laugh, and laughing is much better for the blood pressure. We have a volunteer program at BOTW too, in our Blog Directory. Obviously not of the same scope as theirs, but then we have a core group of OCD types on staff here that edit like a few thousand volunteers each, which negates the need to rely heavily on our volunteers. We keep the program available because it offers folks that’d like to add sites at their leisure in an area of their interest. Since we rely on the paid staff for the bulk of our input, the volunteers arent under pressure to produce. They are like guys collecting butterflies… they add the ones they like to the collection when they run across them. Having heard for a decade that the Dmoz volunteers only join to add their own sites (ok, that’s occasionally true, but more often not)… the policy we’ve adopted with our volunteers is pretty simple. If someone gets a volunteer login and vanishes after a couple of adds… those are removed. Our program will not be subject to criticism for that particular reason… better to have a few that enjoy it than many that abuse it. How Does the BOTW Blog Vol Program Work? Basically adding blog sites is pretty simple… you pick an area of interest, you add sites that fit the criteria. If you have a site in that field, start with the other related blogs in your own blog roll. Look at related sites on THEIR blog roll. Piece of cake. Can we add our own? Bottom line, if assisting as a BOTW Blog Volunteer appeals to you, we’re always happy to look at new folks. Just fill out the app correctly and you’ve got a fair shot at getting in. Let me know if you have any questions.